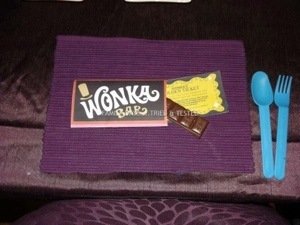 Everybody loves Charlie & the Chocolate Factory.Willy Wonka rocks! 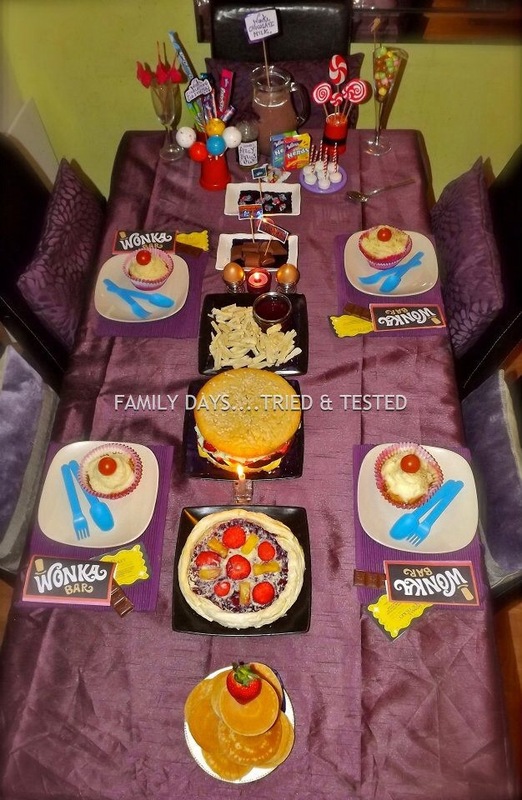 This is one of the kids favourite themed teas we’ve done & very simple to do, an upside down back to front teatime treat based around Charlie & the Chocolate Factory. 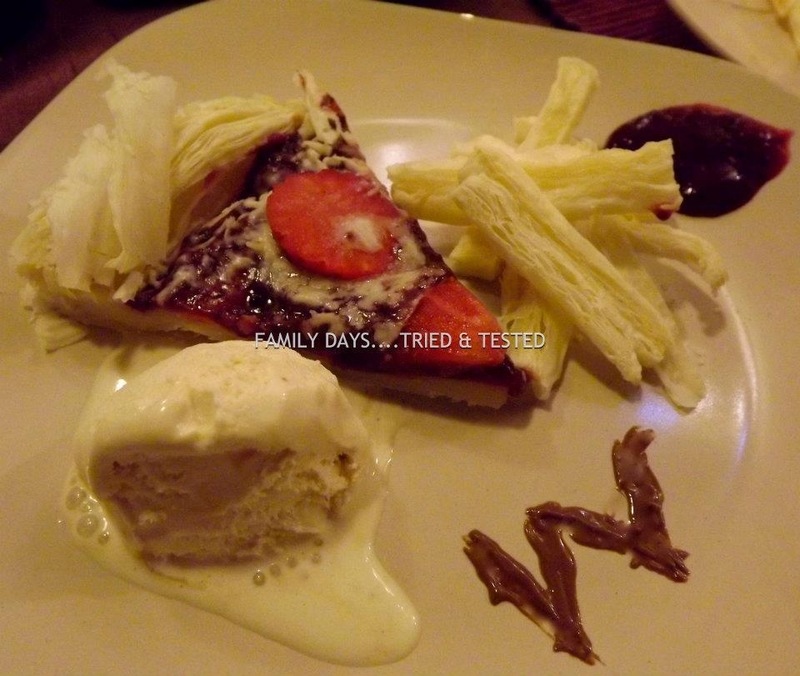 A proper healthy dinner and pudding consisting of shepherds pie followed by sponge cake and filo strawberry tart…but all with a difference. Looks can be deceiving. We rounded off the meal by watching Charlie and the Chocolate Factory with our sweets. If you like this, you’ll also enjoy our BFG Inspired Fun Day. 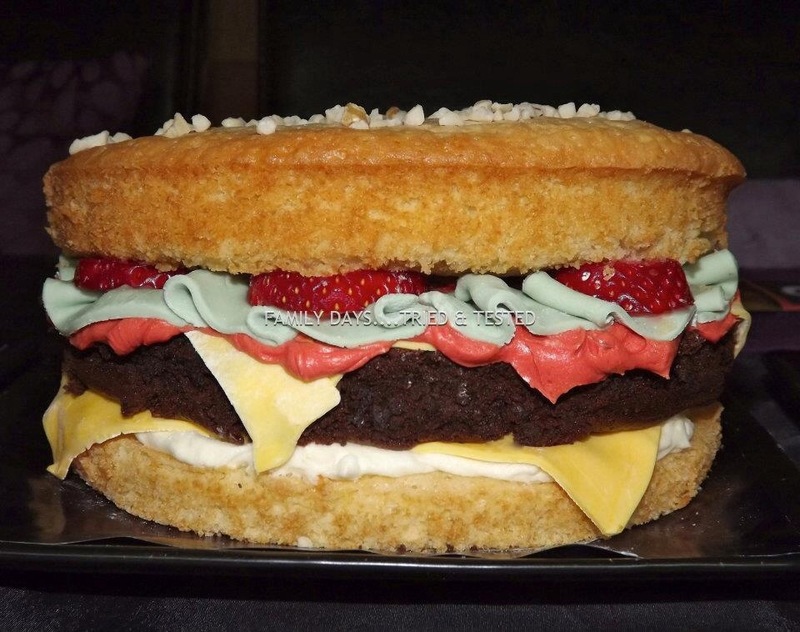 Ready mixed vanilla sponge from Tesco for the bun and chocolate sponge for the burger.. the lettuce & cheese consists of ready roll icing with food colouring, the tomatoes are sliced strawberries, the ketchup and mayo consist of buttercream with food colouring, & the sesame seeds are chopped nuts. 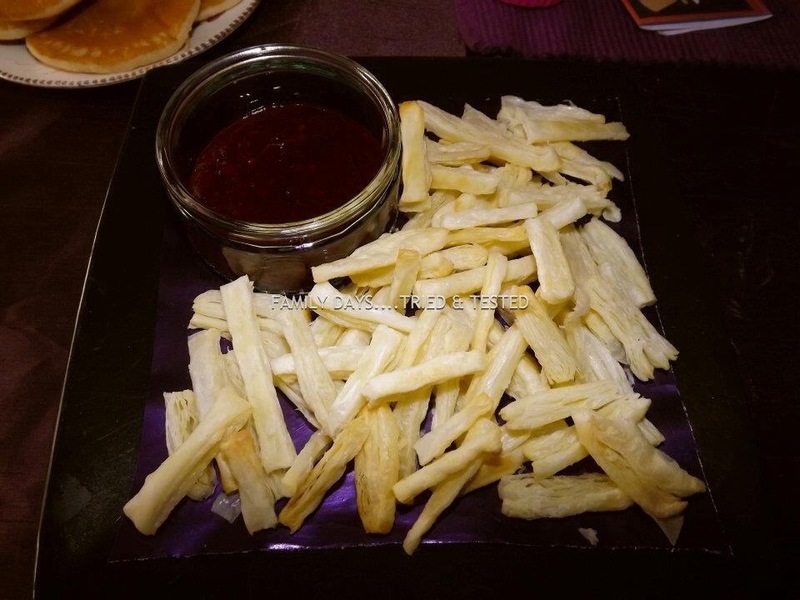 Sweet filo fries and a ketchup (rasberry compote) dip. Tesco value mini pancakes.. (approx. 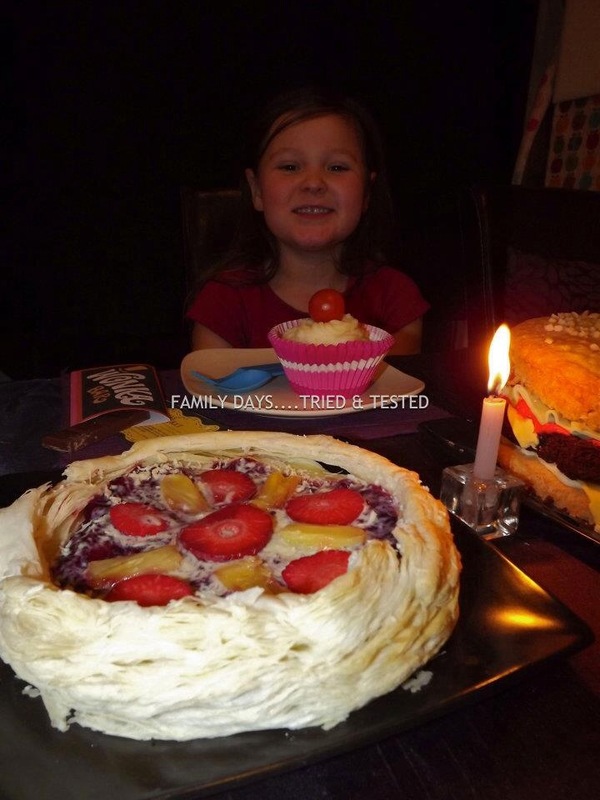 30 per pack of 6/8) pile on top of each other and skewer down the middle to keep in place the taller the better…you could drizzle with chocolate sauce for effect and yumminess. 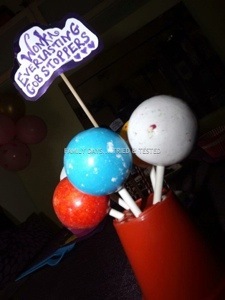 Scene set with sweets… I got gobstoppers on sticks from Tesco for 50p each… I made the wonka logo and stuck it to a stick. 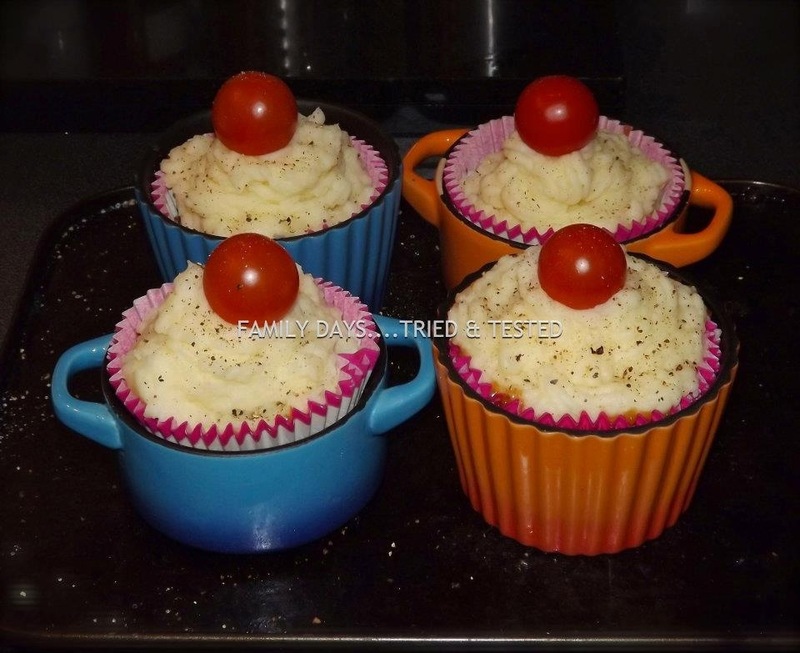 I used simple plastic flowerpots to put sweets in…you can buy them for about £1 for 6 and they are perfect colour to match the theme. 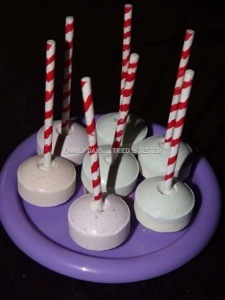 Simple lollipops with a bit of marker pen colour added to the sticks for effect. 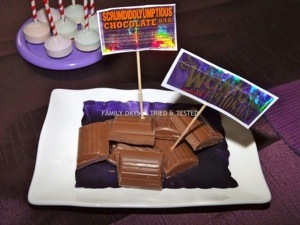 Again a plate of chocolate with homemade printed labels to add to the effect. i managed to buy some purple wrapping paper and find an old purple curtain to use as a table cloth. 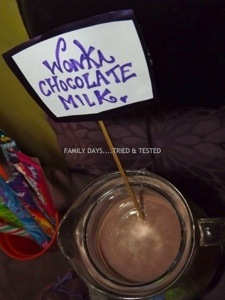 A jug of chocolate milk shake is a must, make a label for effect. 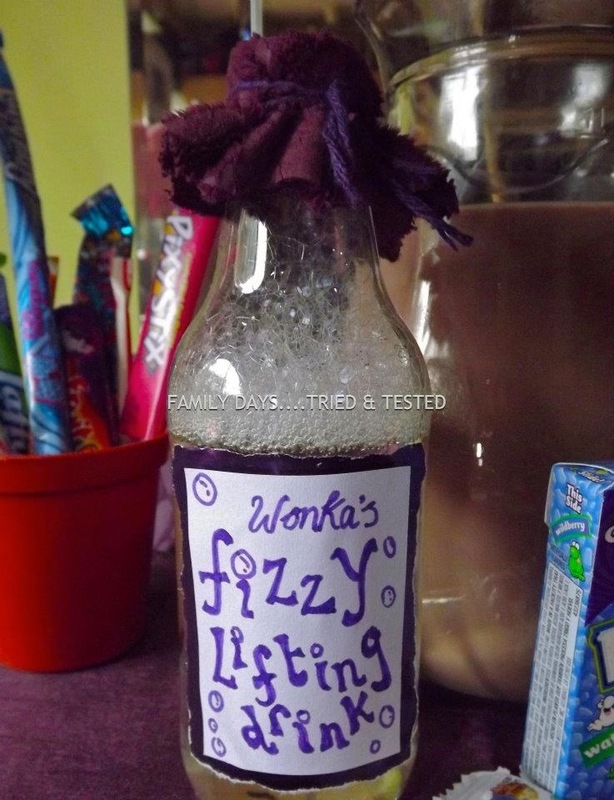 Again, simple labels made and stuck onto bottle, this bottle has water with washing up liquid in to create the bubble (glue the top on so no one accidentally drinks it) you can buy bottles of pop and replace the labels. Upside down back to front tea…. TIME TO CALL THE KIDS FOR DINNER!!! 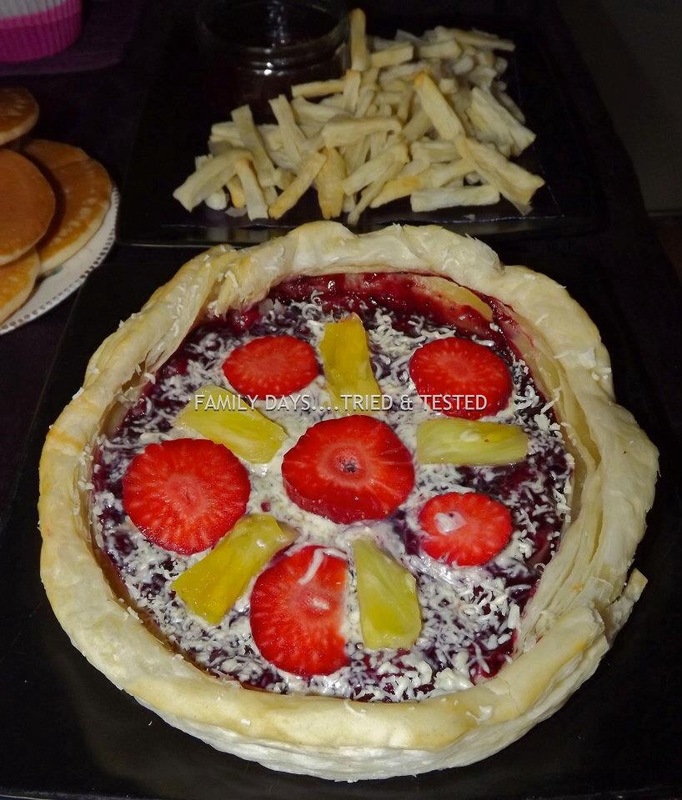 Pizza and chips for pudding. 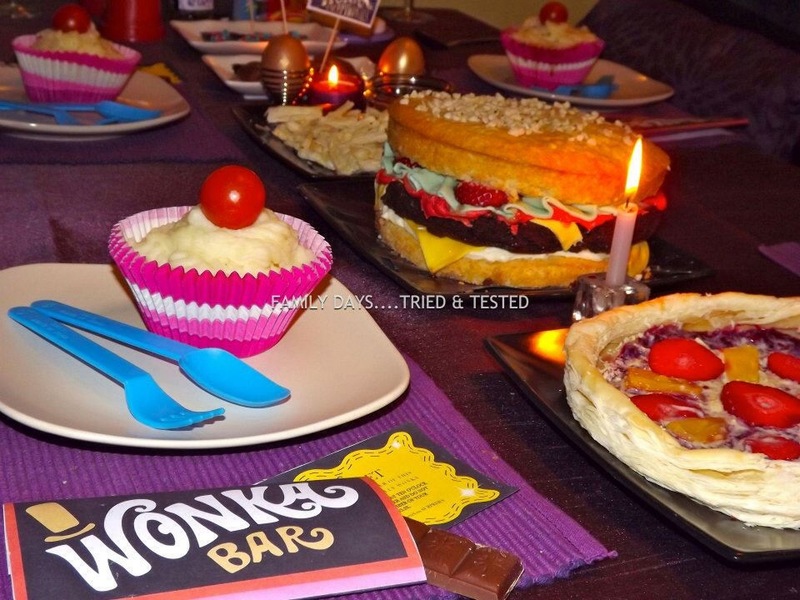 Do have a look at our Deceptively Fun Dinner for more fun ways with food to fool the kids. 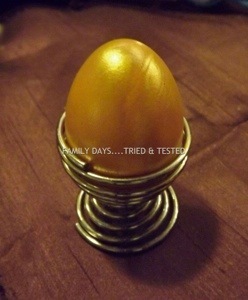 You can get the kids to paint up some golden eggs to set the scene. 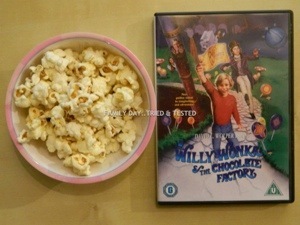 After dinner we relaxed with popcorn and a film. 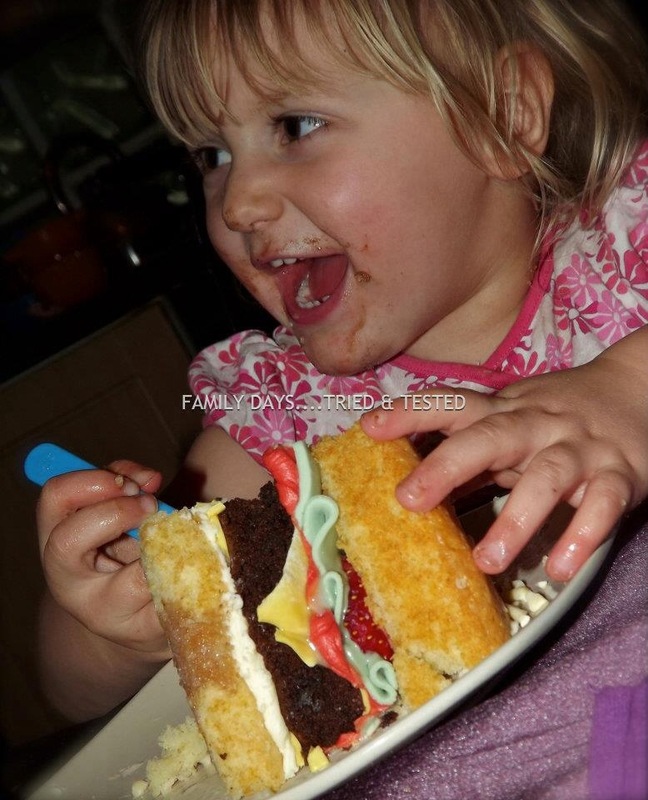 Have a look on Facebook to find out more about how we put together our Wonkalicious tea. Do follow us on Facebook for more of our daily fun, frugal and magical memory making activities & adventures during a childhood that’s fleeting. And if you want to make breakfast fun we’ve got a brilliant End of Term Breakfast idea and you can have a lot of fun with eggs. 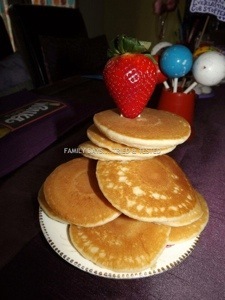 Or how about fooling the kids with this Fun Deceptive Breakfast? this is a wonderful idea!!!!! It was fun and utterly delicious! Thank you for your comment.